St-Germain-L'Auxerrois, named for Saint Germanus, the 5th century Bishop of Auxerre, sits just across the street from the Place du Louvre on the Right Bank. When the King moved to the Louvre in the 14th century, St-Germain-L'Auxerrois became his parish church, and remained the church of royalty for many years. It was also the church of many artists, poets, and architects, many of whom are buried in the church. Today it continues to serve artists, with an annual Ash Wednesday mass in memory of those who have died. Built over several centuries, it shows a variety of architectural styles, ranging from the Romanesque belfry to Gothic. Its stained glass dates from the 16th century, and it contains sculptures from as far back as the 13th century. The organ was originally given to the Sainte-Chapelle by King Louis XVI and was transferred to St-Germain-L'Auxerrois during the Revolution. Today it is in need of repair, and a major fundraising campaign is underway. 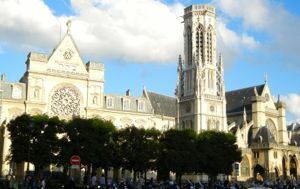 St-Germain-L'Auxerrois also played a rather notorious historical role, when its bells signaled the start of the Saint Bartholomew's Day Massacre on August 24, 1572. This killing of the Huguenots, or French protestants, followed the marriage of Henry of Navarre to Marguerite de Valois, sister of the French king. Riots spread beyond Paris, resulting in the deaths of several thousand Huguenots. Above, Church of St-Germain-L'Auxerrois, Paris.